There’s no feeling in camping quite like being suspended off the ground while you sleep, like a caterpillar in your own waterproof cocoon. 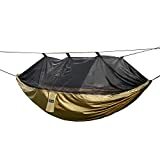 These Top 5 Best Camping Hammocks Tents are great for setting up camp on uneven ground, or away from the forest floor where there could be roaming animals, snakes, insects and what have you. We’re big fans of hammock tents anyway, and recommend them to anyone in search of a different experience — just be sure to take care of the trees you choose*. The OUTAD Nylon Hammock with Mosquito Net is a great introductory hammock tent for people who want to try the experience out on a fairweather trip. It won’t stand up to the kind of elemental abuse of some higher-end hammock tents, but it is waterproof and comfortable. Weighing in at under 1kg, the OUTAD packs away into a small carry bag, and can support and impressive 180kg of weight, although we don’t recommend getting to frisky with someone else while you’re hanging up in your hammock! 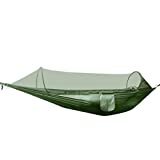 Comes with 2 ropes and 2 carabiners, plus an integrated ‘stuff sack.’ The OUTAD Nylon Hammock is roomy, with a semi-transparent net on the top, which also doubles as a mosquito net. Simple zipper system for entry, and the whole thing rolls up tightly into its own special carry pouch. The OUTAD is composed mainly of lightweight nylon, making it both flexible and strong. Fairweather camping trips and backyard adventures. One of our favourite Top 5 best camping hammocks.